Executive Summary Many Tasmanian farmers and communities were affected by drought during 2007 to 2010, with Exceptional Circumstances (EC) declared in some agricultural production regions. The State Government and other organisations implemented drought initiatives, in an attempt to reduce the negative impacts of drought on farmers, their families and communities. A significant investment was made in providing support to those affected by drought, with over 45 initiatives offered to support farm businesses, farming families and rural communities, including education, financial, social and emotional, and farm production support measures. It is important to evaluate the effectiveness of the drought initiatives, and identify which forms of assistance provided the most value for farmers and rural communities. Evaluating the effectiveness of drought initiative programs can contribute valuable lessons for government and other organisations interested in assisting rural communities, guiding the design and implementation of future assistance measure. 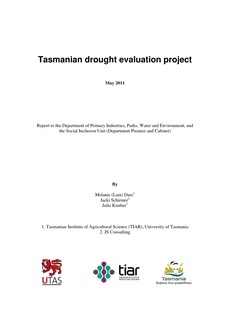 This report provides an evaluation of the drought initiatives implemented in Tasmania from 2007 to 2010, assessing the social dimensions of initiatives using qualitative research techniques. Interview and focus group discussions were conducted with over seventy farmers, farming families and service providers, providing a rich and detailed description of the impacts of living through the drought and the value of support mechanisms provided. The „Tasmanian Drought Evaluation Project‟ was initiated and funded by the Department of Primary Industries, Parks, Water and Environment (DPIPWE) and the Social Inclusion Unit (SIU), Department of Premier and Cabinet. The objectives of the study were to develop an understanding of the effectiveness of the drought initiatives provided during this time. This included: a) examining the relative value of initiatives provided to different farmers, families and communities b) identifying the effectiveness of information provision methods used to communicate support measures available during drought c) identifying any gaps in the support measures provided d) identifying the cost of living pressures faced by farmers, families and communities during the drought period e) exploring the strategies used by individuals or communities to ameliorate cost of living pressures during the drought period (see project Terms of Reference provided in Appendix 4) The study highlights the interactive nature of drought impacts and drought initiatives, stressing the need to recognise that drought impacts people in different ways depending on their personal and social circumstances, and that drought initiatives need to be able to support this diversity rather than using a „one size fits all‟ approach. Study participants identified three main categories of value provided by drought initiatives: emotional and social support, financial support, and the support of farm production, with both long and short term benefits recognised. It is important to understand that individual drought initiatives may provide more than one type of support (e.g. financial assistance through emergency relief payments provide short term financial support as well as emotional and social support through the reduction of financial stress). The „shot gun‟ approach to information dissemination was favoured among service providers, with a wide range of communication channels used based on the assumption that people access information differently. Common information techniques included the media (newspaper and radio), internet/email, community meetings, and word of mouth, with farmers who participated in the study typically preferring to receive information via the media and email/internet, as these enabled them to hear about the support available and seek further information. However more personalised forms of information sharing such as word of mouth and opportunities to meet drought initiative service providers (community meetings or events) were also appreciated, as these were trusted information sources and enabled potential support recipients to form relationships with service providers prior to seeking assistance. Alternative forms of information distribution were identified, including the use of social networking sites. Overall the drought initiatives were well received, although it was acknowledged that government support prior to and after EC declaration would have been beneficial and potentially reduced the extent of the drought impacts, with farmers in particular identifying the value of mental health support initiatives, financial counselling services, and agricultural extension programs. An additional gap discussed by participants was the need for more support for farmers with regards to stock culling activities, which are associated with negative impacts on mental health. The study highlighted further gaps in knowledge about the impacts of drought on rural communities. A high reliance on community leaders to support their communities and lead drought response initiatives was identified. Such leaders need to be recognised and supported by the government and other service providers, preventing burn-out and the loss of positive social capital. This need was emphasized by the vulnerability of those communities that did not have strong community leaders,and subsequently require more support than other communities in order to successfully access and implement drought initiatives. Pressures on the cost of living resulting from impacts of drought vary for each family situation. Farming families utilised the available drought initiatives (especially the financially based initiatives offered by the CWA and Salvation Army), family support, and off farm income to reduce the impacts of cost of living pressures.